Jamie Sykut, left, explains the CTE program at Tuesday's school board meeting. OSWEGO, NY – The Oswego school board heard about a program that can help give Oswego High School graduates a leg up heading to college or entering the workforce. At Tuesday night’s meeting, Jamie Sykut, who teaches technology at OHS and oversees the TV production at the school’s television studio WBUC, told the board about the CTE Diploma Endorsement Program. 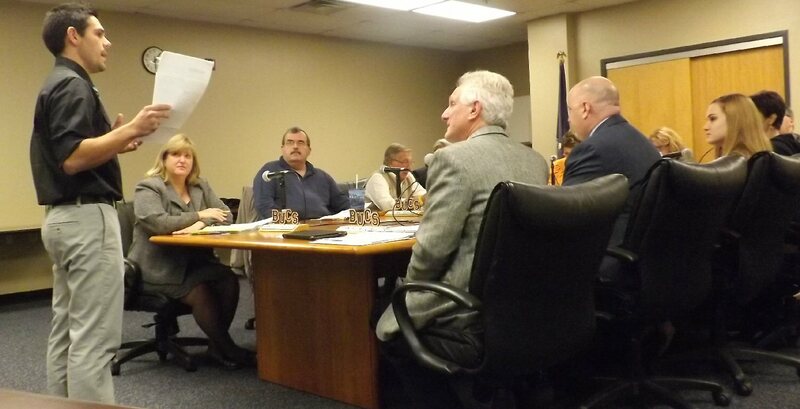 Jamie Sykut, left, explains the CTE program at Tuesday’s school board meeting. It is a state approved program. “Our high school has some very unique opportunities for our students. Looking at what we have, Ken (Kern) and I have been looking at what we can offer and how we can expand on that,” Sykut said. A pathway for these CTEs is a multi-course sequence. Students in the program have to complete a portfolio and they have to complete an industry standardized test – similar to a Regents test. Another part, to bridge the gap with colleges, the district needs to have an articulation agreement. The key benefits of having this program would be the non-cognitive skills that go along with what they can teach kids for this trade or whatever that pathway might be, he added. The state approval is a four-step process. The first thing to do is a self review of the proposal. “So in looking at the courses we would want to include in the pathways we would compile them and review them. To look at everything to see how it meets state standards as far as teaching a class. But also what type of work-based learning experiences do kids have,” he said. Once it is all completed, it would go to an external review. And once that comes back, it would be presented to Superintendent Ben Halsey for his consideration. Then, with his approval, it would come to the board of education. If the board were to approve it, it would go to the State Education Department for its approval. “The good thing about this is how it all jells together as one. Having work-based learning we do that already, especially in the technology department and the science department. We do a lot of that hands-on work in and outside of the classroom, trying to teach our kids these hands-on skills that are going to help them down the road whether they are going to college or are doing this as a career,” he said. Board member Heather DelConte asked if there were a certain number of students that would be allowed in the program. “No, it’s open to anybody who wants to participate. We’re really trying to make kids aware of it, coming in from the middle school. Making sure that they’re aware as freshmen and not when they’re in the 11th grade saying, ‘hey you can try this pathway thing,’ because by then it’s a bit too late to start from the beginning. There would be too many credits that would be needed. Plus it’s a body of work; you’re completing a portfolio,” he explained. “Bottom line, do you have a dollar figure?” asked board member Tom DeCastro. It is possible to get things in place for the program by the fall of 2015, he said. They have to explore the possibility of can students taking certain classes this school year apply them to the program next fall, he added. He will continue to move ahead with the program and hopefully present it to the superintendent and board in the near future, he said. The program allows OHS students to have a special designation on their diplomas saying they are not only college ready but career ready, said Dr. Dean Goewey, assistant superintendent for curriculum and instruction. “Any time we can enhance a program that we already have to provide opportunities for our kids after they leave us is good,” Dr. Goewey said. The district already has an articulation agreement with Cayuga Community College, which means that they recognize the district’s programming for TV production. Having an expansion to an existing program open to all students, not just a small demographic would be a good thing for the high school hopefully helping to increasing the graduation rate. The $24 cost of the test should be borne by the student/family though just like the cost of the AP exams which is twice as much. If a student chooses to participate in a program above an beyond the norm that should not be the taxpayers burden.